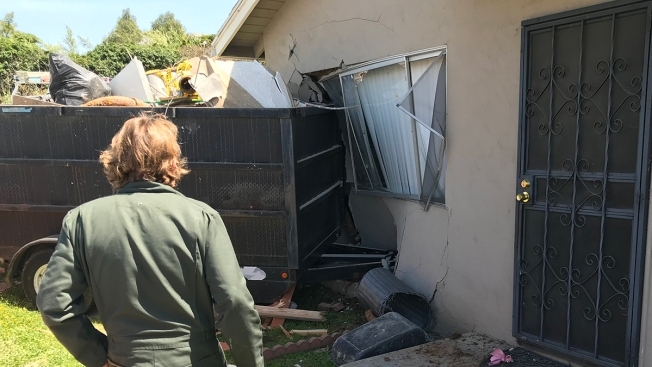 A neighbor's renovation project turned into a nightmare for a family living in Lemon Grove Monday when a trailer full of trash got away and slammed into the side of their home. The incident happened around 1 p.m. near Palm and Washington streets. A trailer filled with debris from the remodeling project rolled across the street and slammed into the side of a neighbor's house. Abigail Jimenez was on a couch in the family's living room when she heard a noise that sounded like something rolling. "Somebody was beeping. I thought it was a car crash but it hit my house and it pushed my couch and my baby sister," she said. "We fell down and I went to go get my grandma." Heartland Fire-Rescue officials said no one was injured. A building inspector will determine if the home is safe for residents.